Deciduous subshrub, up to 1.5m high, with annual shoots; native to Asia from Mongolia to Japan; leaves odd-pinnate; leaflets narrowly ovate to oblong, acuminate; racemes terminal; corolla white or pale yellow (var.flavescens and kronei) or purple-red or red (var.galegoides). Radix Sophorae flavescentis (kushen, lightyellow sophora root) is a TCM listed in the Pharmaopoeias of China and Japan. It is used for the treatment of arrhythmia, diarrhea, gastraointestinal haemorrhage, skin disorders, eczema, jaundice, vaginits and asthma. The root contains the quinolizidine alkaloids matrine and matrine oxide, which are also found in decoctions of it. Among the twenty compounds isolated from the dichloromethane extract are three pterocarpan derivatives, eleven flavanones, two flavanonoles, two chalcones, a chroman, a isoflavone and one coumarin. The flavanoid fraction inhibited 5-LOX, and 2'-methoxy kurarinone (isokurarinone) was the most effective compound. 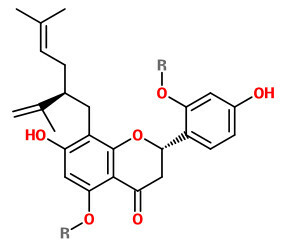 Sophoraflavanon G (norkurarinone) inhibited 5-LOX as well as COX-1 and COX-2 (as potent as indometacin reference).